Ramallah – IOF raided the village of Dir Ghasaneh and arrested university student Musallam Barghouthi. 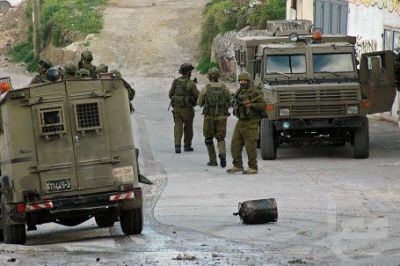 Jenin – IOF raided the city of Jenin and arrested Saleh Mutlaq Saadi 32-year-old, the two brothers Fathi 27-year-old and Anas Mohammad Atoum 25-year-old. Nablus – IOF raided the city of Nablus and the tow refugee camps of Balata and al-Ein, and arrested 8 citizens: Ahmad Dawla, ex-detainee Abdullah al-Ikir, Sameh al-Asmar, Anan Bashaker, Omar Mayadmeh, Omar Abu Khameel, Ehab Zaid and Omar Darawshe. Nablus – IOF raided the town of Salfit and arrested Azeez Fatash. Bethlehem – IOF arrested 3 workers from the town of Beet Fajjar: Majdi Abed al-Hakeem Taqatqah, Nazar Yousef Taqatqah and Eyad Mohammad Taqatqah. Bethlehem – IOF raided the town of Taqou’ and arrested Mohammad Saleem Sabbah 20-year-old and Musa Mohammad Awad Rashaydeh 30-year-old from the village of al-Rashaydeh. Bethlehem – Israeli intelligence arrested the boy Abed al-Hadi Hammad from the city of Bethlehem. 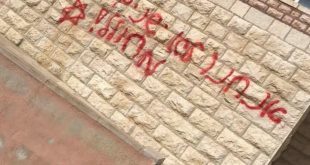 Bethlehem – IOF severely beaten up Ahmad Hassan Heih from the tow of Sorief. Hebron – IOF raided the town of Dura and arrested Rezq Abdullah Rjoub, Ahmad Suliman Qeeq and Jamal Hussein Awawdeh and sent them into unknown destination. Hebron – IOF raided the city of Hebron and arrested 4 citizens: Fathi Suliman Joulani, Monzer Jab’ah, Jawad Karaki and Belal Mohtaseb. Hebron – IOF raided the town of Beet Kahel and arrested Kayed Atawneh and sent him into unknown detonation. Hebron – IOF arrested Mohammad Falah Hamdi Abu Maria 23-year-old near the military tower located at the entrance of Beet Ummar village near Hebron.